Is It Too Late to Add Deck Lighting to an Already-Built Deck? 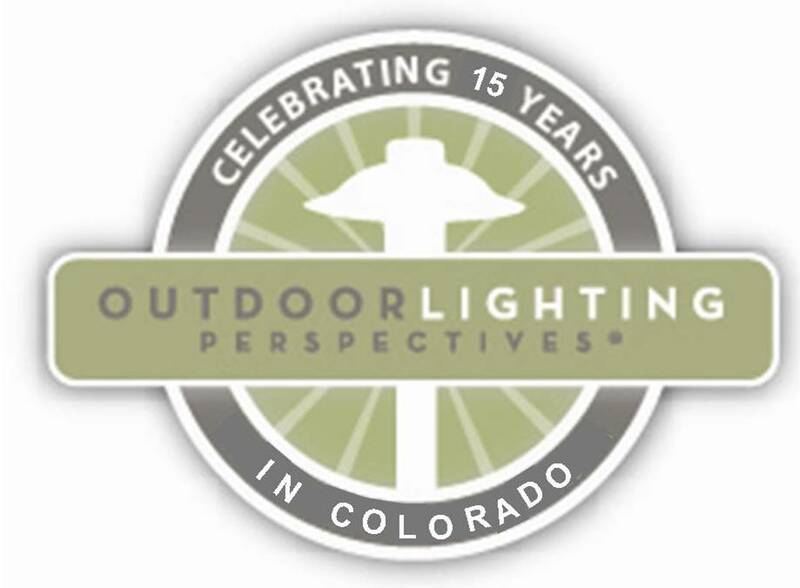 That is a question that we at Outdoor Lighting Perspectives (OLP) of Colorado are frequently asked this time of year as homeowners look forward to using and enjoying their outdoor spaces. Our response is that it is never too late to add deck lighting. At a project that we completed this week, the homeowner wanted to have deck lighting installed in the back yard in addition to landscape and architectural lighting for the front yard. 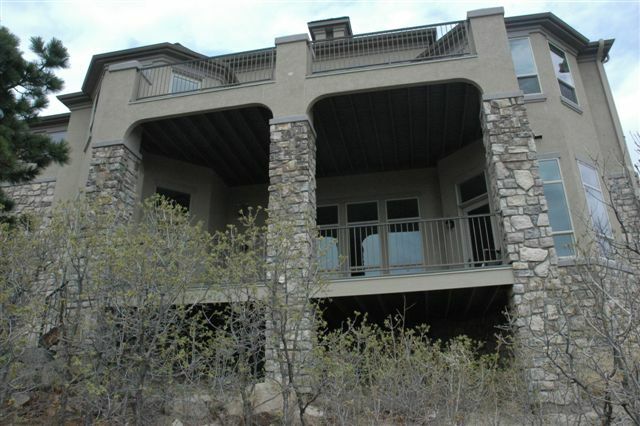 They wanted three deck lights installed on each of the stucco columns on the upper deck. They wanted to be able to control the deck lights manually via a switch inside the house – next to the door leading out to the upper deck. They did not want to see any exposed wiring. 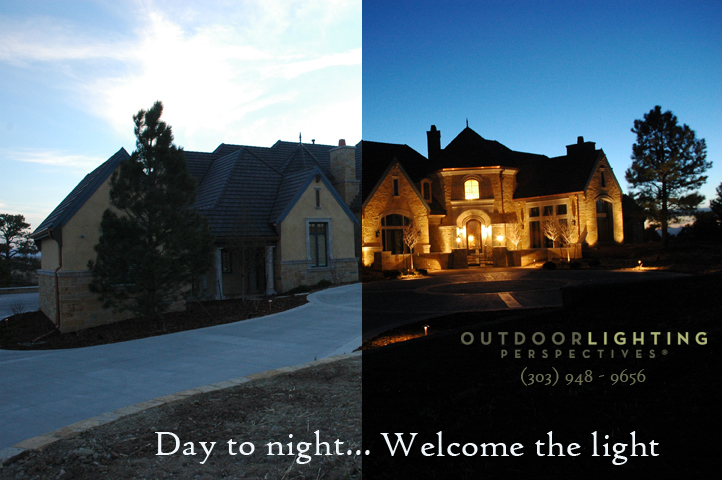 They wanted to have both automatic and manual control options for the landscape lighting in the front yard. Our installation crew was able to open a small access hole at the bottom of the center column and at the top – and to successfully pull the low voltage wiring home run to the upper deck. From there, the connections to the other two deck lights could be made and wiring pulled to each of the deck light locations. In a few spots, the wiring was hidden at the base of the columns with moulding strips painted to match the stucco. The final result looks like the lighting was installed at the same time as the deck – no visible wiring and no visible conduits. 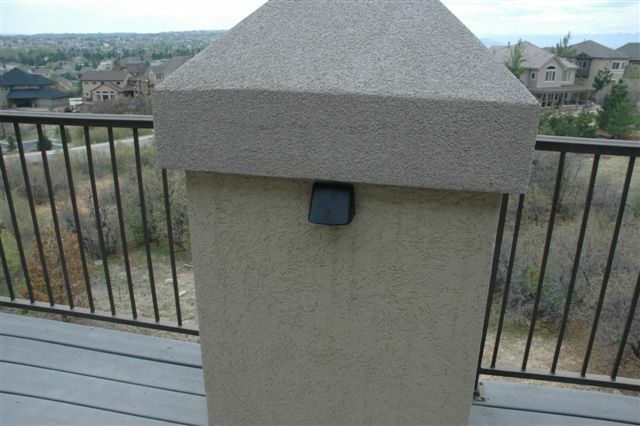 The deck lights were also painted to match the stucco after this photo was taken so that they would blend in to and become part of the column itself. Lastly, the manual control of the newly installed deck lights was easily accomplished through the use of OLP’s Lighting Control Automation™ (LCA). The low voltage transformer powering the deck lights was mounted under the lower deck – and on a different electrical circuit than the switches shown in the photo. The switch on the left side controls the carriage lights on the deck – and the switch on the right controls the lights in the dinette. The switch on the right side originally looked exactly the same as the one on the left. 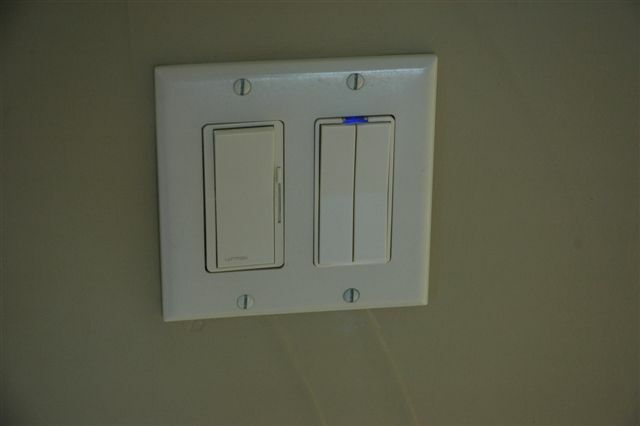 In the photo, the switch on the right was replaced with one of our LCA intelligent switches (note the LED at top), and instead of a solid Decora switch plate – it is now split in half vertically. The left side now controls the dinette lights as before and the right side now controls the new deck lights. Through the use of LCA technology, the deck lighting switch sends a signal from this totally unrelated electrical circuit over to the circuit powering the transformer. It was as simple as that – no new extensive hard-wiring nor interior drywall/painting repairs were required to accomplish this. 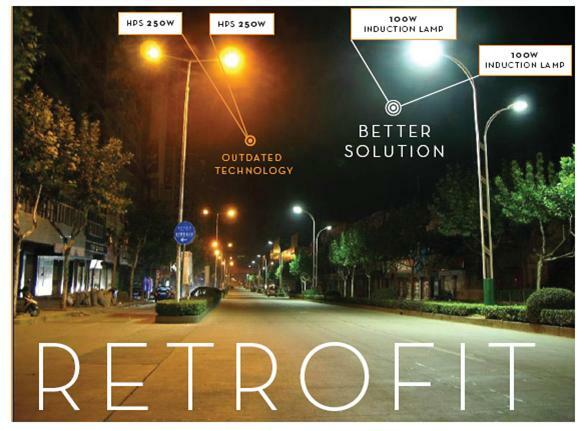 So it’s never too late to add to add deck lighting to your outdoor spaces – and summer is right around the corner!